Welcome To S.A.P.S. Lets us be your guide to the other side. 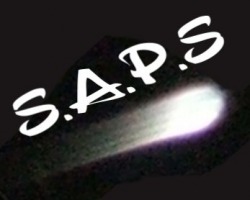 S.A.P.S was founded in 2006. It started off as an enthusiast group mainly out for pictures and fun. After one amazing night, it turned into something more. In May 2007, our group ventured into The graveyard, which isn't usually HAUNTED per-say, but we caught the most amazing thing on Camera. From then on, we became investigators. Getting High tech gear to help with our "hunts" and upgrading our cameras and equipment as we went. Both of the founding members have grown with numerous paranormal experiences and have done research above and beyond what the "normal" person does in basic curiosity. Follow us in our journey to investigate. The term Paranormal Investigator usually brings the idea of "Ghostbuster" into your mind does it not? Well that's not quite what happens. When we go out, we go to try to DISPROVE a haunting. We use our technology to Debunk the activity going on and try to find other explanations. For instance... Cold spots- Holes in walls, windows with poor weather stripping... anything that could cause a draft. Banging- Loose pipes, or anything that could be knocking against walls when you walk by. Its those things that CANNOT be explained we need to look into further. Quite often when you have a true haunting, there is really no other explaination. Intelligent Haunts- In these instances, the Spirit seems to really want to communicate. These are the ones that seem to possess human emotion and personalities although its of course limited. These ones usually appear in human form, however trying to capture a picture you will get an orb or mist instead of a full on human form. These ones do have the ability to touch people, and interact with surroundings (eg. Making the temperature drop and so on). Remember though, Dust can look a lot like an orb, but orbs aren't see through, they are full on balls of light that give off their own light. Again, try to disprove... look at the image close to see if maybe it was a bug. Residual- This is a very common type of haunt. It is brought on USUALLY by emotional states. For instance, a war takes place and its very tragic, leaving its emotional imprint on the land or surrounding objects. So if you have some weird things that happen same time everyday, and cannot be debunked.. maybe look at objects in your home... maybe your grandmothers old rocking chair, or grandfathers pocket watch.These will NOT interact with you. They aren't actually a spirit, they are just the imprint and will replay itself over and over given the right atmospheric conditions, be it the time, the day, the year.... or even the weather. This is also considered a "time-displacement" haunting. Inhuman or Demonic- This is one you do not want to mess with, you do NOT want to stay in your home and you do NOT want to communicate with. These are mean and malevolent creatures. They mean you harm and usually do harm those they are around or investigators that come in to try to help rid the homeowners of the "Guest". Please keep in mind, these have been known to be brought forth by Pagen Rituals, Ouija bored and Seances if not done properly. These tools may seem harmless at first, but when you are opening these doors, everything your letting in is invisible, so you have NO idea what your letting in!